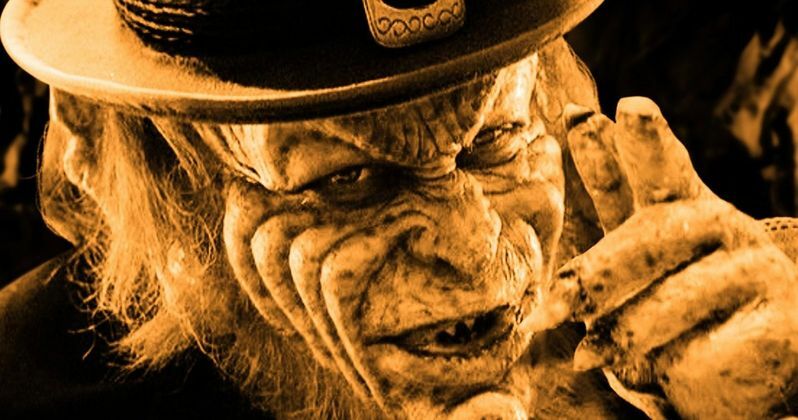 This weekend marked another St. Patrick's Day, and to celebrate, writer-director Darren Lynn Bousman took to Twitter to let us all know that he still wants Lionsgate to hand him the keys to a semi-classic horror franchise: Leprechaun. Yeah, true story. Evidently, Darren Lynn Bousman wants to bring back original franchise star Warwick Davis and send the little green guy back in time to the Colorado Gold Rush. Which sounds pretty awesome. Specifically, Bousman says this. "It's that time of year again where I remind my good friends at @Lionsgate that I still want to reboot the Leprechaun movie (AGAIN)... Lep gets in a time machine and goes back to the Colorado Gold Rush. You guys have my number, I'll be sitting by the phone." Screenwriter Scott Milam, who worked with Bousman on his remake of Mother's Day, then tweeted this. "We pitched Lionsgate, remember? I wanted to cast William Shatner as the owner of the cash for gold who Leprechaun robs. Just so he can look to the sky and curse LepreCHAAAUUUNNNNN." Classic. Total classic. But that's not all. When some big industry people shared Bousman's tweet, Bousman replied yet again, saying that he was going to will his reboot into existence one way or the other and - get this - he plans on doing it as a rock opera with Paris Hilton! I'm sure he's kidding about that part. Right? After all, he did make Repo: The Genetic Opera which starred Hilton. So you never know. Then Hatchet writer-director Adam Green told Bousman that we are all going to laugh at him (a Carrie reference) to which Bousman said. "Let me laugh. Warwick Davis and I will be having the last laugh... right to the BANK!" So, yeah, it seems Bousman wants to bring original Leprechaun and Willow actor Warwick Davis back into the fold. Warwick sat out the past two reboots with Linden Porcho taking over the role most recently in Leprechaun Returns. For those of you out there that might not know, Bousman is the director of such genre min-classics as Saw II, Saw III, and Saw IV before he moved onto flicks such as the above-mentioned Repo! The Genetic Opera and Mother's Day along with more recent movies such as St. Agatha, Abattoir, The Barrens, The Devil's Carnival, and 11-11-11. As for the Leprechaun franchise, the whole shebang kicked off back in 1993 with writer-director Mark Jones's original comedy classic starring Jennifer Aniston. Again, you read that right. That original series continued with Rodman Flender's Leprechaun 2 in 1994, Brian Trenchard-Smith's Leprechaun 3 in 1995 and Leprechaun 4: In Space in 1997, Rob Spera's Leprechaun in the Hood in 2000, and finally Steven Ayromlooi's Leprechaun: Back 2 Tha Hood in 2003. The series was then rebooted back in 2014 with director Zach Lipovsky's Leprechaun: Origins, and the most recent reboot came last year with Steven Kostanski's Leprechaun Returns. So five sequels and two reboots later, does the Leprechaun franchise need yet another reboot? If it's Darren Lynn Bousman making a rock opera with Paris Hilton, I'd say hell, yeah! Am I kidding? I'll never tell. This fun piece of news was initially shared by Darren Lynn Bousman himself over on Twitter . Writer for Arrow In the Head, Dread Central and Movieweb.